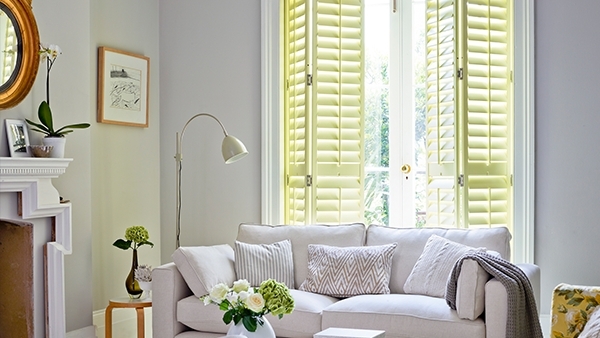 Bright shutters are a great way to give your room design a boost of colour. Show off your fabulous shutters by making them a showpiece. The capital is currently abuzz with talk of trends – the London Design Festival and London Fashion Week are in full flow, with bloggers and journalists furiously tweeting and typing away, uncovering the latest trends and colours that we’ll be using in our homes over the coming months. With the memories of the coldest winter in years still in our minds, it seems that we’re looking for distractions from the gloomy outdoors this year, and using bursts of bright colour to liven up our homes. Many of these tones we’ve seen already this year, with emerald still dominating our homes and bright neon pinks set to remain popular well into winter. For many, it’s hard to include such colours in the home in a suitably subtle way – yet using Shutterly Fabulous’ unique colour matching service makes this difficult task a piece of cake –shutters are an ideal way of including pops of colour into your home without dominating the entire room, and getting the colour you want is as easy as providing a sample. Whilst these bright colours seek to inject a sense of vibrancy and excitement into our homes during the colder months, old Autumnal favourites such as burnt orange and rich purple shades are still firm favourites during this time of year. Use shutters from Shutterly Fabulous to incorporate these colours into your home, adding personality and staying ahead of the trend.